Generous funding from Northwestern University Libraries has guaranteed the expansion of “Renaissance Books, Midwestern Libraries,” an initiative I began in 2014 with a Mellon-based seed grant. This undergraduate-powered project aims to report Northwestern’s pre-1700 Special Collections holdings to the English Short Title Catalogue, the British Library’s foremost online catalog for early printed books printed in England or in English. When we began almost four years ago, Northwestern’s representation in the ESTC was a meager 188, but thanks to the diligent work of Weinberg College students Hannah Bredar, Erin Nelson, Nicole Sheriko, Katie Poland, and Jake Phillips, there are over 2,500 pre-1700 volumes at Northwestern Special Collections matched to the catalog, with shelfmarks and some copy-specific details. Updates on the first phase and second phase of this project, which included exhibits and symposia, can be found on this website. In this third stage of this project, I have teamed up with my English Ph.D. colleague Anne Boemler to supervise the reporting of hundreds of pre-1700 books at smaller Northwestern-affiliated libraries. These libraries include: Garrett Evangelical Theological Seminary’s Styberg Library, the Galter Health Sciences Library, and the Northwestern Law Library. We estimate there may be as many as 3,000 ESTC-eligible books printed before 1700 at these smaller libraries; matching them into the catalog would double the work we have done already, putting these items “on the map” for scholars/ESTC users who might be in town to conduct research nearby (say, at the Newberry Library). This portion of the work is also an opportunity to refine Northwestern’s ESTC presence more broadly — for instance, a library code still existed for Northwestern’s Dental Library, which was subsumed into the Galter Library when the Dental School closed decades ago. In addition to reporting the pre-1700 books at these libraries, Phillips and Poland are also associating each of these volumes with an EEBO-TCP code. This will offer Martin Mueller a clearer idea of which poorly-imaged EEBO titles might be redigitized freshly for users requiring textual content (part of a move toward a “FrEEBO”). This phase of the work is expected to continue through the end of the Spring term, concluding with an exhibit on theological books at the Styberg Library. If you are interested in knowing more about what old books can be found at Northwestern, feel free to email me; I can supply a mostly comprehensive list of pre-1700 holdings at the Charles Deering McCormick Library of Special Collections in Evanston. The list will continue to grow as this Spring’s collaboration goes forward. This fall, I have been trying out a number of strategies to integrate writing exercises, literary readings, and Special Collections visits in my undergraduate pedagogy. These experiments – that’s the word I prefer to use – allow the classroom to become a kind of laboratory for humanistic inquiry and expression. In the course I’m currently teaching, an English composition seminar entitled “Forms of Belonging,” I use a variety of writing technologies and pedagogical media to help my students think carefully about the texts they read and the ideas they communicate verbally and in written forms. One assignment I’ve been using for this course is a seventeenth century-style “commonplace book.” Here, I’m adopting a pedagogical technique used already by many of my colleagues in early modern studies, including Colleen Kennedy, Adam G. Hooks, and many others; this account simply represents what has worked for me. In this course, the commonplace book has encouraged my students to write regularly in an informal and process-oriented (rather than product-oriented) way. On the first day of class, I introduced my students to the idea of a commonplace book, spending about 5 to 10 minutes talking about what they were, who used them, and why. As a specialist in early modern literature, this was an opportunity to bring some field-specific knowledge into the composition classroom, but I kept it very light and brief so as to foreground the actual purpose of the exercise: regular writing practice. For commonplacers, I said, originality wasn’t a requirement – in fact, “gathering and framing” textual material from various sources (advertisements, texts we read in class we read, texts we don’t read in class, songs overheard on the radio, etc.) would be an ideal way to fulfill the assignment. An affordable, spiral-bound “commonplace book” for my Eng 105 course (with iPhone for size comparison). Northwestern MS 67, fol. 2r. Kind courtesy of the Charles Deering McCormick Library of Special Collections. This book, Northwestern MS 67, has handwriting in both italic and secretary scripts; arranged alphabetically, it includes passages from authors including Lucretius, Shakespeare, and Sidney. My students were particularly struck by the unfinished quality of this vellum-bound volume — over half its leaves are completely blank, really exposing this kind of text as a work-in-progress. Altogether, looking at this book enabled my students to think across time and across textual media, linking their own commonplacing experiments and composition exercises to the material text in front of them. It made for one of the best class meetings we had. Not all colleges or universities have commonplace books like MS 67, but digital resources can acquaint students with English miscellanies such as Folger E.a.1. This is certainly an exercise I’ll want to continue for a variety of courses, and I’ll be eager to learn new ideas about recruiting the commonplace book for teaching purposes (including from you, dear reader). The early modern reader Frances Wolfreston (1607-1677) has attracted a considerable amount of attention from scholars in recent decades. “Frances wolfreston her bouk,” she often wrote in her copies of seventeenth-century publications. Intriguingly, Wolfreston sometimes left short critical remarks in her books, rare and invaluable assessments of literature from a woman in early modern England. If you’re reading this, you might know that these books aren’t all in the same place, which poses a challenge (or travel opportunity) to those who want to know more about Wolfreston’s reading habits. Dispersed among many research libraries, her collection includes the only surviving 1593 copy of Shakespeare’s Venus and Adonis, which Johan Gerritsen discussed in pioneering 1964 article, as well as a Folger copy of Chaucer’s Workes (which Sarah Werner discusses here), a UPenn Q3 copy of Shakespeare’s Othello (which Werner also wrote about here), a book called The Schoole of Vertue at the University of Illinois and a copy of Mary Wroth’s Urania at Illinois State (both of which Sarah Lindenbaum wrote about here), and Boston Public Library copies of The Merchant of Venice, The Taming of the Shrew, Eastward Hoe, and A Pleasant Conceited Comedy, Wherein is Shewed, How a Man May Choose a Good Wife from a Bad (jointly discussed here by Lindenbaum, Lori Humphrey Newcomb, and Jay Moschella). In some cases, she indicates where she bought her books, or from whom. If you want to know more about these and other “bouks,” Paul Morgan’s 1989 article is an essential source, for it includes a list of 106 printed books owned by the Wolfreston family, with 95 of them inscribed by Frances. This week, I came across Wolfreston’s copy of Thomas Heywood’s The English Traveller at the Huntington Library in San Marino, CA (RB 64122). The catalog specified that this particular copy featured the book plate of Robert Hoe and that its binding was signed “Matthews.” Upon opening it, however, I was delighted to find both an autograph and a brief critical assessment from Wolfreston, who was 26 years old when The English Traveller was published. This was two years after she married the landowner Francis Wolfreston (as many have noted, this story isn’t one without a little name confusion; the Wolfrestons had children named Francis, too). Lindenbaum has told me that this copy of The English Traveller was included in a Sotheby’s sale of 1856 and that there are several other Wolfreston-Hoe books at the Huntington Library, though this Heywood playbook’s whereabouts have been obscure. 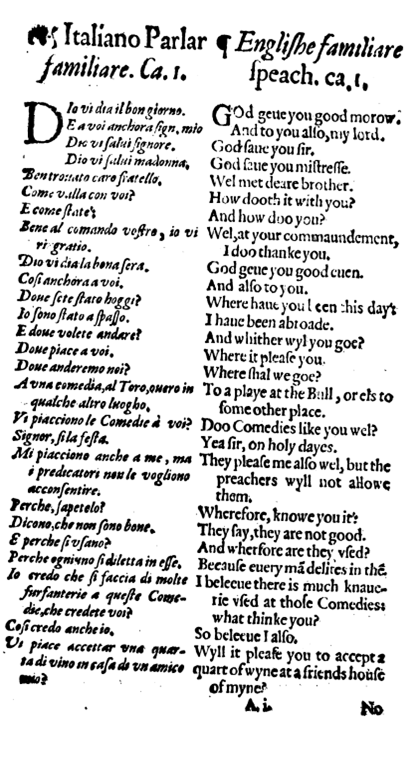 On the first page of the play’s text, you can clearly read “francis wolfrest[on] / her bouk” (sig. A4r), and below the play’s prologue on the facing page, “prity one” (sig. A3v). By “prity,” Wolfreston may have meant something along the lines of cleverly done, ingenious, or artful (OED, adj. 1b) quite likely mingled with “pleasing; attractive or charming” (adj., 2b). To be sure, the fathers and sons in this tragicomedy ultimately reconcile, though a character named Mistress Wincott does die of grief after an secret affair with Young Geraldine’s best friend Dalavill (scandalously, Young Geraldine had been attracted to Mistress Wincott the whole time, with Mr. Wincott completely oblivious). Perhaps Wolfreston was won over by the comic subplot, which features – I kid you not – a scene in which drunken revelers collectively hallucinate a shipwreck inside another character’s home. Have I convinced you to read The English Traveller? RBML began two years ago during the summer of 2014 and culminated in an exhibit showcasing dozens of items uncovered during the project (find a digest of the first phase here). Working from a checklist of local holdings compiled by Gary Strawn, Northwestern undergraduates Hannah Bredar, Erin Nelson, and Nicole Sheriko successfully “matched” over 1,200 pre-1701 items into the ESTC. This raised Northwestern’s representation in the catalog from an initial 188 items to almost 1,500. What remained after this portion of the project were books issued between 1683 and 1700, as well as our so-called “hard cases” — identifications requiring recourse to the physical item. With funding generously granted from Northwestern University Libraries, RBML continues in its second phase this summer at Deering Library. In consultation with Special Collections head Scott Krafft and Professor Emeritus of English Martin Mueller, I’ve hired two undergraduates to participate in this project’s second phase: Katie Poland and Jake Phillips. Both are sharp-witted, dedicated, and undaunted by bibliographical terminology. This month, and in less than two weeks, Katie and Jake have successfully stretched Northwestern’s ESTC representation to almost 2,500. Working through the year 1700 in the original checklist, they have also handled hundreds of hard cases, leafing through Northwestern’s early printed books to confirm an imprint or a tell-tale variant in order to match an item with an ESTC record. This project also provides opportunities to correct Northwestern’s local catalog as well. Through their work, Katie and Jake have turned up dozens of difficult items resisting easy identification, from the famous to the obscure to the bizarre. In consultation with Professor Jeffrey Masten, they examined Northwestern’s copy of Shakespeare’s Second Folio (1632), which could be any of nine possible states of the book on account of its missing preliminary leaves (this item will receive more scrutiny during a dedicated project). They’ve also come up with nineteenth-century reproductions of mid-seventeenth century publications mistakenly cataloged as the real deal, and have puzzled through single-leaf items, title-pages in pen facsimile, and bound volumes containing a range of separately-issued publications. While it’s quite unlikely for RBML to uncover a new edition for the ESTC altogether, Katie and Jake have identified what certainly seem to be previously-unreported issues of well-known books. One of these is an English translation of Réné Descartes’s A Discourse of a Method, printed in octavo in 1649 by the stationer Thomas Newcombe. Northwestern’s copy of this book represents a small, but unrecorded link in the early English reception history of Descartes. According to the ESTC, there are three known states of Newcombe’s edition of the Discourse, which was the first English translation of any of Descartes’s writings to appear in print. The first featured a bordered title-page, specifying in the imprint that it was made by Newcombe “for John Holden at the Anchour in the new Exchange.” A second issue retains this imprint, but lacks the decorative border. Yet another issue, also from 1649, lacks the border and does not include Holden’s name, reading simply “Printed by Thomas Newcombe. MDCXLIX.” and signed A4. Northwestern’s copy occupies a place among these latter two, during a period in which it seems Newcombe himself took over the sale of the book. It features the same setting of type throughout, but the imprint reads “Printed by Thomas Newcombe, and are to be sold at his house over against Baynards Castle. 1649.” (It is also signed A4). The lack of a record in the ESTC does not mean this issue is completely unknown, or that Northwestern possesses the only known copy of it. However, the creation of a corresponding record for this issue in the ESTC may help librarians and scholars track down and account for this book (and others like it) in a more complete and systematic manner. This is only a small picture of the good work that Katie and Jake are doing this summer for Northwestern Special Collections in particular and for early modern researchers at large. This post offers a recap of “In the Shadow of Shakespeare: 400 Years,” a single-evening exhibit and program on non-Shakespearean anniversaries held on April 7, 2016 at Northwestern University, and coordinated by the NU Early Modern Colloquium. Photos are courtesy of Elizabeth Rodriguez, English PhD candidate at NU and producer and host of the podcast Rude Tudors. One of 2 copies at Northwestern: Francis Beaumont and John Fletcher, Comedies and Tragedies (London, 1647). Charles Deering McCormick Library of Special Collections, L Kestnbaum B379p. 2016, as you probably know, has been defined largely as “the year of Shakespeare.” All over the U.S. and the English-speaking world (and beyond), universities, schools, libraries, theaters, and cultural institutions of all kinds – even restaurants (!) – are celebrating the 400th anniversary of Shakespeare’s death. “Too much, or not too much: That is the question,” began a December 2015 Wall Street Journal article on this year’s worldwide celebration. For those answering “Not too much,” the First Folio is coming or has come to a city near you, thanks to a program put together by the Folger Shakespeare Library. And if we can understand all this excitement as a kind of Renaissance earthquake jolting us from our modern sensibilities (one can hope), Chicago is arguably its epicenter. With 850 events at 120 sites across the city, and featuring more than 1,000 artists from around the world, Shakespeare 400 Chicago is an impressive feat. As someone who studies the literature and culture of the Renaissance, I’m lucky to live in the midst of all Chicago’s Shakespearean enthusiasm, and I’ve also been glad to participate in writing for City Desk along with several of my colleagues and other early modernists in the greater Chicago area. Like a number of universities, Northwestern has its own program, too: ShakespeaRevel. All 19 items included in this open exhibit featured a label written up by a PhD student. The display highlighted Beaumont and Cervantes, but also featured a broader context: works by King James I, Michel de Montaigne, Samuel Purchas, Edmund Spenser. The stationer William Stansby was responsible in some way for several of these items. But in coordinating “In the Shadow of Shakespeare: 400 Years” at Northwestern, and in a way intended not to undermine, but to accompany and expand these citywide festivities, my early modernist colleagues and I wished to ask: “What else?” and “Who else?” Here, we hoped to join the conversation surrounding the Beaumont400 Conference at King’s College London, the “Dare to Tell” Ben Jonson conference at the University of St Andrews, and Cervantes programs at the Newberry Library, the University of Pennsylvania, and other institutions too numerous to list (see #Cervantes400). We know Shakespeare’s life came to an end in 1616, certainly. But what about the Elizabethan theater entrepreneur Philip Henslowe, whose diary has been a major source for our knowledge about Renaissance drama? He died the same year. Or Francis Beaumont, Shakespeare’s playwright contemporary, also dead in 1616? Or the English writer and voyager Richard Hakluyt, who died that year as well? Of course, 1616 also witnessed the publication of Ben Jonson’s Workes, a dramatic folio without which it is difficult to comprehend the importance of Shakespeare’s First Folio (even as we dust off forgotten copies here and here). The year 1616 also saw the opening of the Cockpit Theater in London. Going beyond England, what about Miguel de Cervantes, Spanish playwright arguably as influential as Shakespeare in the history of Western literature? Died in 1616. Or Tang Xianzu, a Chinese playwright responsible for the Mudan Ting (The Peony Pavilion) and commemorated in a recent edited collection? There’s another. And what about 500 years ago? Thomas More’s Utopia and Lodovico Ariosto’s Orlando Furioso both saw print for the first time in 1516. “In the Shadow of Shakespeare” attracted faculty, students, & staff from Art History, Classics, English, French & Italian, Gender & Sexuality Studies, NU Libraries, Spanish & Portuguese, and Theater and Drama. To broaden this year’s 1616 conversation in Chicago (and beyond), “In the Shadow of Shakespeare” featured a PhD student-curated exhibit of 19 early printed books featuring some (not all) of the figures listed above. In this way, it built upon ongoing collaborations at Northwestern between humanities faculty, graduate students, and librarians, especially Renaissance Books, Midwestern Libraries in 2014-15. Significantly, it also included a series of brief talks by early modernist faculty from diverse fields: William West (English and Classics), Jeffrey Masten (English & Gender & Sexuality Studies) Dario Fernandez-Morera (Spanish & Portuguese), Sylvester Johnson (African American Studies & Religious Studies), Kelly Wisecup (English), Paola Zamperini (Asian Languages & Cultures), and Sophie Lemercier-Goddard (visiting this month from the Ecole Normale Supérieure de Lyon). Limited to five minutes apiece, each speaker posed insightful and provocative questions: If we’d retained seventeenth-century dramatic tastes and valued Beaumont above Shakespeare today, what might we quote instead of “To be, or not to be?” What can we learn from closely examining the clothing in Simon van de Passe’s 1616 engraving of Matoaka (Pocahontas)? How could an electronic edition of Samuel Purchas’s writings expand our knowledge of early modern culture, religion, and race? What were the dramatic afterlives of More’s Utopia? Beginning in Shakespeare’s London and expanding outward to the Mediterranean, the Atlantic World, and the Far East, “In the Shadow of Shakespeare” illustrated the many advantages of delving into a single year in time – across countries, languages, and modern departmental disciplines – and using local collections to inspire curiosity and intellectual exchange. Perhaps we’ll do it all again in 2023, while the rest of the world zeroes in ever-closer on the First Folio. The exhibit also featured this messy copy of Spenser from the same decade. Do you like early handwriting? Edmund Spenser, The faerie qveen. The shepheards calendar (London, 1617), Charles Deering McCormick Library of Special Collections, Large 821.3 S74f1617. Beyond the people mentioned above, there are many people to thank for the success of “In the Shadow of Shakespeare.” The Early Modern Colloquium is deeply indebted to: Scott Krafft, Jason Nargis, and the library staff at the Charles Deering McCormick Library of Special Collections; Tonia Grafakos and the Northwestern Preservation staff; Sarah Pritchard, Dean of Libraries and Charles Deering McCormick University Librarian; Kasey Evans, English Department faculty liaison to the EMC; graduate students Anne Boemler, Meghan Costa, Rebecca Fall, Lee Huttner, Simon Nyi, Raashi Rastogi, Jason Rosenholtz-Witt, and EMC Co-Coordinator Emily Wood; at the Kaplan Institute for the Humanities, Postdoctoral Fellow Danny Snelson, Graduate Assistant Ira Murfin, and Director Wendy Wall; for library logistics, Suzette Radford, Kolter Campbell, Clare Roccaforte, and Drew Scott. Finally, support for this program came from all the EMC’s 2015-2016 sponsors, including English, French & Italian, the Kaplan Institute for the Humanities, Religious Studies, Science in Human Culture, Spanish & Portuguese, Weinberg College of Arts & Sciences, and Ed Muir. As some of you know, I’m crazy about books, especially old ones. I wouldn’t consider myself a serious book collector, but a couple times a year I treat myself to an early printed book of some kind. Although early editions of drama in the English language tend to be far beyond a graduate student’s budget, Continental imprints are often fairly affordable. It’s my research on Renaissance language-learning and translation that led me to my latest acquisition, a 1610 bilingual edition of Giovanni Battista Guarini’s tragicomedy Il Pastor Fido. Giovanni Battista Guaraini, Le Berger Fidelle / Il Pastor Fido (Paris: Matthieu Guillemot, 1610), title page. Personal collection. 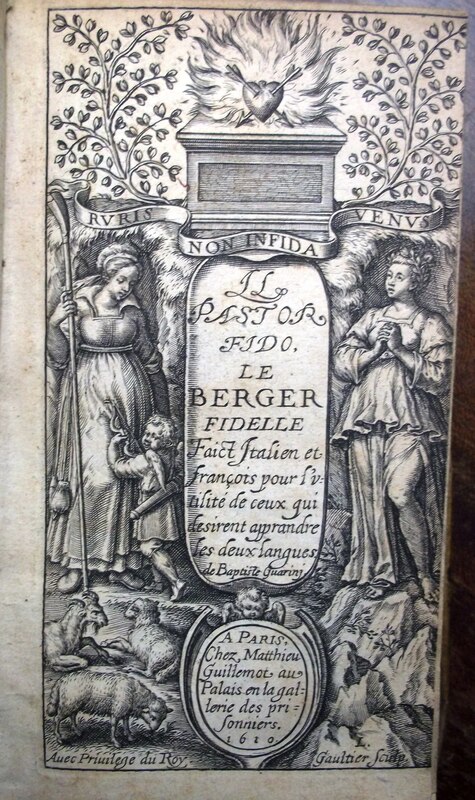 Adding the French title Le Berger Fidelle to Guarini’s Italian play, the title page of this book adds that it is “Faict Italien et françois pour l’vtilité de ceux qui desirent apprandre les deux langues” [Made Italian and French for the use of those who desire to learn the two languages]. Il Pastor Fido was first published in Venice in 1590, in quarto. This stout octavo edition follows a series of French, English, and Spanish translations of the play — as well as an Italian edition issued in London by the stationer John Wolfe — and aims specifically at an audience of language-learners. 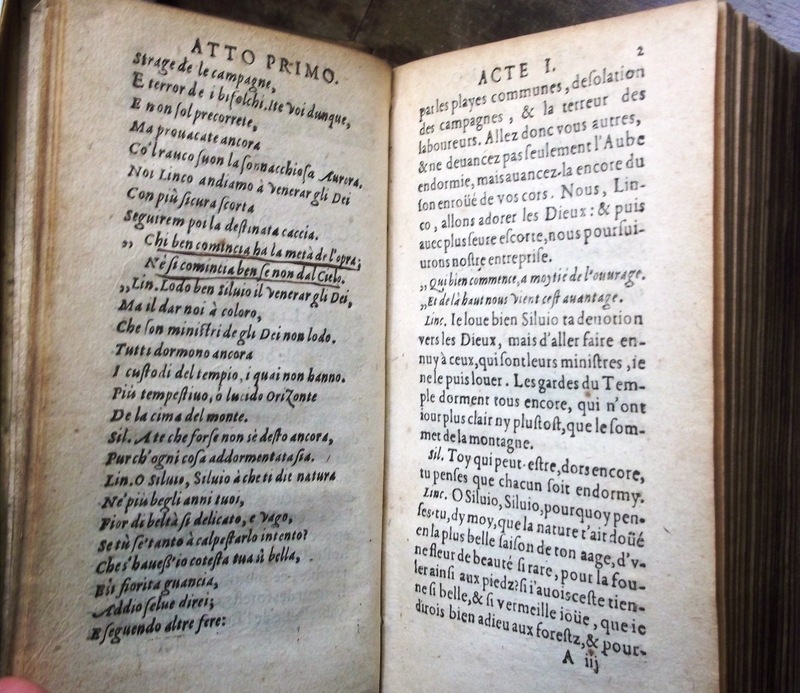 In a preface, the translator asserts that the Italian language “entre les langues vulgaires a cest ho[n]neur d’auoir plus de grace & de mignardise que pas vne autre, pour exprimer vne amoureuse passion” [among the vulgar languages has this honor of having more grace and preciousness than any other, to express an amorous passion]. Il Pastor Fido, a tragicomedy featuring ancient prophecies, unrequited love, and mistaken identities, offers fertile ground for these “amorous passions.” Here, then, is a dramatic application of the language-learning techniques Joyce Boro finds in the period’s bilingual prose romances. Giovanni Battista Guarini, Le Berger Fidelle / Il Pastor Fido (Paris: Matthieu Guillemot, 1610), A2v-A3r. Personal collection. Like many bilingual or polyglot publications from the sixteenth and early seventeenth centuries, this book differentiates languages with its use of typefaces. Italian appears here in italic, while the stationers selected roman for the French. Altogether, this book presents an example of how dramatic publications could be designed specifically for language-learning, and — as Anne Coldiron and Guyda Armstrong have suggested — shows how the principle of translation was not only a linguistic concern, but also a typographic and paratextual concern. Figure 1. Dictionariolvm et colloqvia octo lingvarvm, Latinae, Gallicae, Belgicae, Tevtonicae, Hispanicae, Italicae, Anglicae & Portugalicae (Antverpiae: Apud Henricvm Aertsens, 1662). Northwestern University, shelfmark 413 D554. Abbie Weinberg wrote about editions of Berlaimont’s dialogues earlier this year for The Collation, paying special attention to their unique mise-en-page and diminutive size. As I’ve mentioned before on this blog, this oblong manual witnessed nearly 150 editions from Lisbon to Warsaw, and over a period of almost 300 years. As you can see in the photo above, it could include some combination of Latin, French, Dutch, German, Spanish, Italian, English, and/or Portuguese. The contents included a guide to letter-writing, a dictionary, and a short grammatical treatise, along with a lively set of dialogues. Figure 2. John Florio, Florio his firste Fruites (London, 1578), STC 11096. Huntington Library, shelfmark 60820, in EEBO. In Florio’s Second Frvtes, interlocutors would discuss the theater again, remarking on how in England one can find “neither right comedies, nor right tragedies.” Rather, there are “[r]epresentations of histories, without any decorum” (D4r). Understandably, the dialogues of Berlaimont, Florio, and others have captured the attention of scholars, who often comment on the theatrical nature of these exchanges. In his book-length study of early modern Anglo-Italian relations, Michael Wyatt recognizes a “theatrical structure” in Florio’s bilingual dialogues (The Italian Encounter, 167). William N. West notes in a discussion of cant in Jacobean theater how “the dramatic potential” of bilingual language manuals could be brought to the stage (“Talking the Talk,” 234). More recently, Joyce Boro has stated that these multilingual dialogues have “affinities to closet drama” (Tudor Translation, 22). These observations raise bigger questions for me, though. First, if language-learning dialogues seem so similar to Renaissance plays, then exactly why do they seem so similar? Put differently, what are the characteristics governing both genres? Second, if language-learning dialogues and drama are indeed categorically similar, which plays — in which genre, or by which author — are these dialogues most like? Finally, and perhaps most consequentially, how might this generic similarity come to influence our understanding of Renaissance drama? To begin to answer these questions — and that “begin” is key, so if you’re looking for a definitive answer, best to stop reading now — I opted for a large-scale analysis of dramatic and language-learning dialogue texts using the linguistics analysis software DocuScope (created by David Kaufer and Suguru Ishizaki). In using DocuScope to assess dramatic genres, I’m taking an approach indebted to Jonathan Hope and Michael Witmore, who have used this software to investigate Shakespearean genre, and Ted Underwood, who reminds us how blurry our agreed-upon genres can be. Breaking language down into strings of characters, DocuScope uses more than 100 language action types, or LATs for short, to identify words and phrases common to lots and lots of texts. With this approach, I can investigate dozens of characteristics of these texts at a single blow, drilling down where appropriate in order to assess more nuanced similarities at the level of the sentence. For the dramatic texts, I used a corpus of 320 works of early English drama curated by Martin Mueller. This is where things start to get messy, though. For the language-learning dialogues, I combined 3 EEBO-TCP texts available to me with 6 that I keyed myself, using only the English text columns, and stripping out speech prefixes to match Mueller’s corpus. (Polyglot or bilingual texts have been a relatively low priority for TCP; altogether, the keying amounted to a little over 82,000 words.) Furthermore, none of these 9 texts I’m comparing with Mueller’s corpus have yet been processed with Alistair Baron’s VARD modernization software. (The complexities of using VARD for early modern texts are documented here on the Visualizing English Print blog). Not using VARD certainly adds noise to the results — as the saying goes, “Garbage in, garbage out” — but I’m willing to take the risk in the hopes that some shared characteristics do emerge from the test. Consider this as a single and rather early stopping-point on the longer road of these questions. Figure 3. Principal component analysis of 320 works of Renaissance drama and 9 language-learning dialogues. Each color indicates a separate genre (as you can see, DocuScope is quite good at distinguishing comedies from tragedies). My mini-corpus of language-learning dialogues appears here in green, and occupies a diagonal path through the lower portion of the chart (keep in mind, though, that we’re looking at hundreds of dimensions at once, so “lower” or “left” have little true meaning here). Left to right according to this visualization, they are: Benvenuto Italian’s The Passenger (1612, Ita-Eng), John Florio’s Firste Fruites (1578, Ita-Eng), John Eliot’s Ortho-epia Gallica (1593, Fre-Eng), John Minsheu’s Pleasant and Delightfull Dialogues (1599, Spa-Eng), John Florio’s Second Frvtes (1591, Ita-Eng), Claudius Hollyband’s French Littelton (1576, Fre-Eng), Claudius Hollyband’s French Schoolemaister (1573, Fre-Eng), William Stepney’s Spanish Schoole-master (1591, Spa-Eng), and Noël de Berlaimont’s Colloquia (1639 ed., Polyglot). At a first glance, it seems many of our dialogues are just a bunch of outliers. There are probably good reasons for this, though. First, discrepancy of modernization might be one. Processing my mini-corpus of 9 language-learning dialogues with VARD could address this issue down the road, though only as well as I’d match the conventions in Mueller’s drama corpus, I think. Second, the length of texts is a factor, and an important one at that. Simply put, some of these dialogues are short, and others are very long. Hollyband’s French Littleton amounts to just under 5,000 words, while The Passenger weighs in at a whopping 103,862. Chunking the texts — that is, breaking them up into smaller units — could begin to address this issue, even if it involves its own methodological curveballs. Figure 4. VEP’s principal component analysis of 704 early modern dramatic texts, with dialogues highlighted in black. Accessed 9/5/2015 at Wine Dark Sea. This picture, however, is not what we find for the language-learning dialogues at all. Even if the complications I briefly addressed above play a role here, my corpus of 9 texts clearly falls on the side of comedies instead. This observation leads me to ask a few more specific questions that might get us somewhere. What accounts for The Passenger‘s position among an odd mix of plays — a comedy (Nashe’s Summer’s Last Will and Testament), a tragicomedy (Heywood’s 1 Iron Age), and a tragedy (Marlowe and Nashe’s Dido, Queen of Carthage)? What about Florio’s Firste Fruites is so similar to The Fortunate Isles and their Union, a masque by Ben Jonson? And what factors might land the same author’s Second Frvtes in close relation to Thomas Dekker’s The Shoemaker’s Holiday and Jonson’s The Alchemist (both known today as fairly important “city comedies”)? Figure 5. 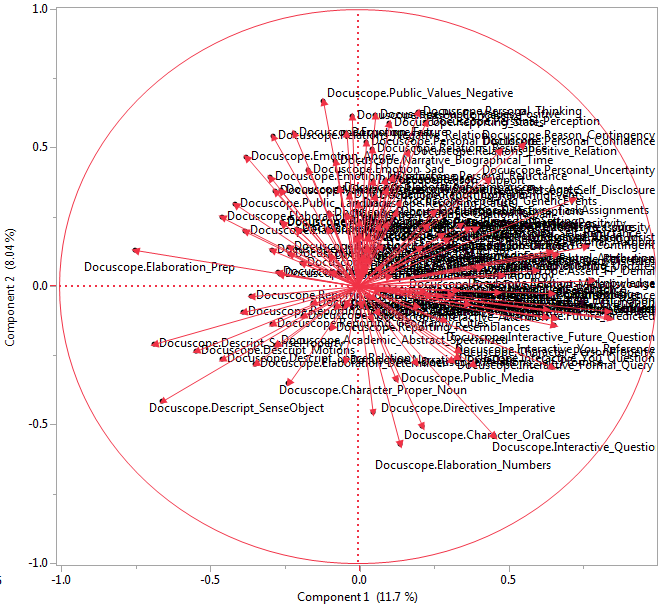 Visualization of vectors for this test representing DocuScope’s 100+ LATs. 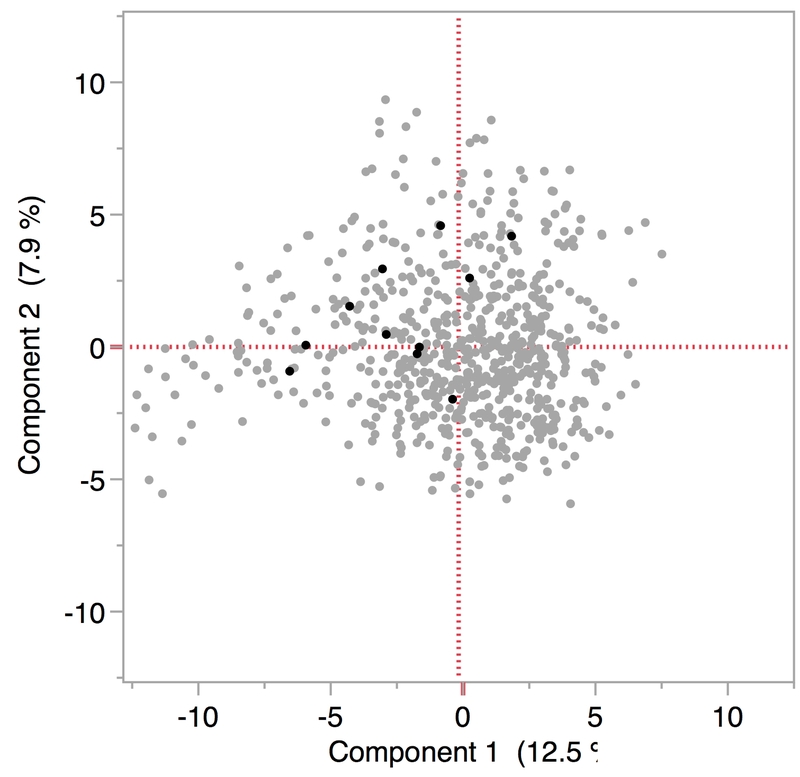 Here, the vectors illustrate the statistical relationships most relevant for generic distinctions among our texts. The direction of the vectors indicates the relative co-occurrence of LATs, and the length of the vectors indicates the strength of their influence upon generic relationships. Focusing on the lower right-hand quadrant, we find a number of LATs commonly associated with comedies: Directives_Imperative, Elaboration_Numbers, Character_OralCues, and Interactive_Question. If we look at Interactive_Question more closely, we find this LAT to be associated first with our dialogues, and second with a handful of Jonson’s city comedies. This LAT uses punctuation to indicate a request of specific information, which makes some sense for books designed to introduce readers to foreign vocabulary, phrases, and information. (Think of lessons in today’s language textbooks: “How much does it cost? Dov’è la stazione? Combien d’etudiants sont-ils?”) The texts in this corpus exemplifying Interactive_Question to the highest degree are Hollyband’s French Schoolemaister, Berlaimont’s Colloquia, and Stepney’s Spanish Schoole-master, each of them in our lower-righthand quadrant. We also find that Jonson’s city comedies The Alchemist, The Case is Altered, and Every Man Out of his Humour display this LAT prominently, along with Heywood’s A Maidenhead Well Lost, Dekker’s Honest Whore, and Fletcher’s The Chances. 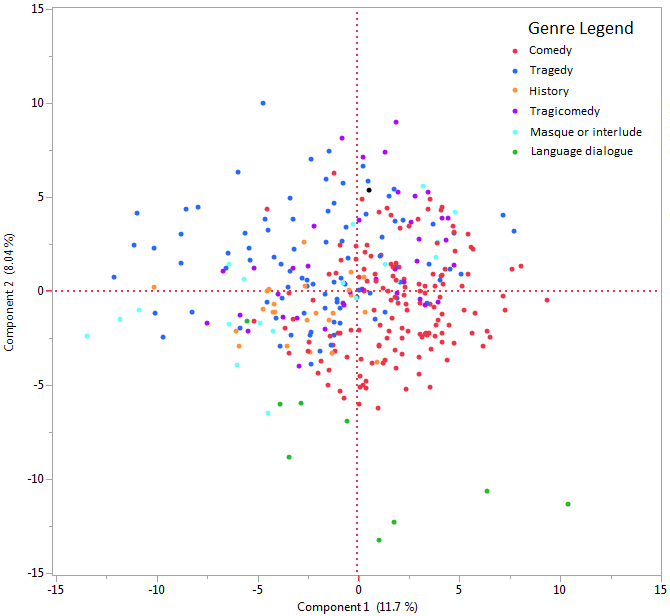 Even if the diagram presents the Hollyband, Berlaimont, and Stepney dialogues as outliers, this test suggests that they nonetheless have something in common with these particular works of drama. The next step would be to look closely at what types of interactive questions one finds in the dialogues vs. in the plays, and to assess those relationships on more qualitative terms. With a similar approach, we can begin to investigate the relationship between Florio’s Second Frvtes and Dekker’s The Shoemaker’s Holiday, which I find a little more interesting. Looking at DocuScope’s tagged texts for the dialogue and the play, we see several coinciding LATs, among them Descript_SenseObject, Assert_First_Person, and Interactive_You_Reference. I’ll just focus on these three for now. Descript_SenseObject consists of concrete nouns, and accounts for the five senses’ perception and experience of objects. Assert_First_Person consists of self-referential language (I, me, etc. ), while Interactive_You_Reference refers to a second party (you, thee, thy, etc.). These LAT definitions are based upon DocuScope’s 2008 dictionaries. To really find out how these LATs play out, we’ll have to take a closer look at the texts. After all, as Witmore and Hope put it, “Digitally based research is not an end point: its findings need to be tested against the texts” (369). 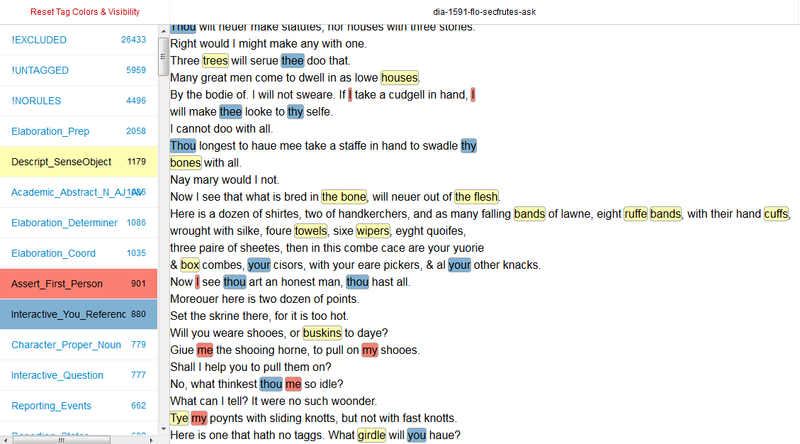 Scanning through the tagged texts of Second Frvtes and The Shoemaker’s Holiday, we can highlight and identify specific passages that feature these LATs, then compare them to see if any patterns emerge. Figure 6. Tagged text of Florio’s Second Frvtes in DocuScope, with Descript_SenseObject, Assert_First_Person, and Interactive_You_Reference highlighted. In this passage, Florio’s interlocutors deal out a series of nouns related to apparel, fashion, and hygiene, words that would appear on the facing page in Italian. DocuScope identifies 15 instances of Descript_SenseObject, and would recognize more if this text were modernized with VARD. (The human eye can identify several more, a testament to our brains’ immensely complex and sophisticated furniture). Accompanying this catalog-like list of things are first-person and second-person pronouns that cushion the vocabulary and frame it into a coherent exchange between two persons. In Florio’s lessons, there’s a need to discuss physical objects (“shirtes,” “handkerchers,” “bands,” “cuffs,” etc.) often many at a single time, as well as a tendency to attribute them to an owner as they circulate or change hands (“your,” “your,” “me,” “my,” etc.). Sir, what ist you buy? Fine cambricke shirts, or bands, what will you buy? How do you sell this handkercher? All cheape, how sell you then this hand? In this scene, Hammon and Jane begin their interaction according a script one recognizes in several language-learning dialogues in this period (“to buy and to sell” being an important component of these manuals). With a series of Interactive_You_Reference (blue), Jane lists a number of objects that DocuScope recognizes as belonging to Descript_SenseObject (yellow): “callico,” “lawne,” “shirts,” and “bands,” and Hammon responds with similar language: “handkercher,” “ruffes,” “band,” etc. However, at a certain point, “hand” joins this list of commodities as Hammon begins to woo Jane, turning from potential customer to potential lover. Although he tries to replace the dialogue’s focus on “I/me” and “you” with a first person plural — “Good sweete, leaue worke a little while, lets play” — Jane refuses to follow him, claiming her hands as her own (“My”), and this resistance matches what Hope and Witmore observe in Twelfth Night between Cesario/Viola and Olivia (372). Altogether, the language we find here in Dekker’s play — and this is one out of several passages featuring these characteristics — resembles the instructional dialogues of Florio and other language tutors. Furthermore, the many questions in this exchange — identified in DocuScope as Interactive_Question — illustrates this scene’s similarity to the dialogues of Hollyband, Stepney, and Berlaimont, located in the lower right-hand quadrant of our PCA diagram. Some of this might seem rather unsurprising to scholars of Renaissance drama. After all, it’s well established that comedies, and city comedies in particular, tend to focus on commodities and rapid exchanges between pairs of characters. Karen Newman’s important essay “City Talk” discusses this connection, particularly as it relates to women in Ben Jonson’s Epicene. Douglas Bruster uses the term “materialist vision” to account for this phenomenon in these plays (Drama and the Market, 38-46). So, couldn’t we identify these two passages’ similar characteristics without computers? These reflections come out of some investigations I made earlier this summer as part of Early Modern Digital Agendas: Advanced Topics (find our conversations documented at #EMDA2015). I’m grateful to all participants and faculty for their suggestions, especially Michael Witmore, Jonathan Hope, and Jacob Tootalian.